My most recent (2017) build was actually the trigger for this post: I’m very pleased with how it turned out and how well it works (and I’m hoping it will continue working so well). If you care about the details of the various builds, and some of the backstories: check out my extended PC List. And you, dear reader? Do you remember your old rigs too? So much to do, yet so little time. Three weeks of vacation have come and gone. Two weeks of work have come and gone. One of those work weeks was even a week #OffsiteCoding, where we went to a great (I’d dare even say luxuruous) location with the whole IT team, to work (dedicated) on a new part of our product. Cranking up my skills with WPF, which I’ll be using at work a bit more the coming months. Much of my inspiration for new projects comes from finishing other projects. 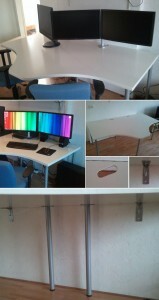 Have a look at the picture for the most recently finished project: a custom (home) made desk for two workplaces at home. Problem with this approach for getting inspired: every finished project gives me inspiration for two more! Like I said: so much to do, yet so little time. A luxury problem, I suppose.